View of Mario García Torres, “Caminar Juntos” (Let’s Walk Together), 2016. Mario García Torres’s exhibition “Caminar Juntos” (Let’s Walk Together) is held at four different locations across Mexico City but all within the parameters of the artist’s Museo de Arte Sacramento, a “museum without walls” in the state of Coahuila, Mexico, conceived by the artist between 2002 and 2004. Theoretically, all of this show is included in the geographic space of Torres’s museum. The work Redrawing the Exhibition Space or Museo de Arte Sacramento in Mexico City, 2004–15, presents the floor plan of his institution, which is nearly 200,000 square feet, superimposed over a section of the city. The Tamayo Museum, one of the exhibition’s galleries, hosts the largest cross section of the artist’s work. Opening with a printed version of his floor plan, Torres’s installation suggests a dislocating play between time and space. 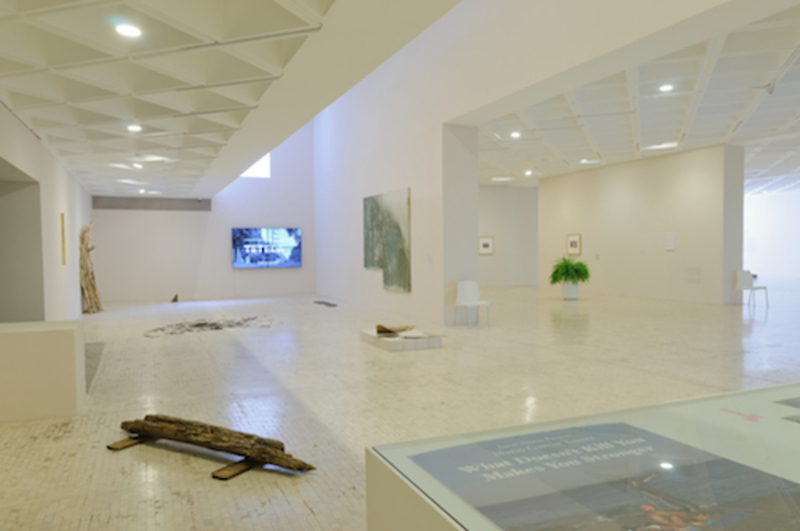 His museum is a self-determined space for conceptualizing ideas within the context of physical geography, but Torres also allows for disruptions therein. The ongoing series “Prometo . . .” (I Promise . . .), 2004–, is a continuous thread throughout the installation here and comprises a simple set of twelve sheets of his writing on the letterhead of hotels he resided in while researching and producing this show. While the letters provide suggested finish dates for his works, also embedded in them is a promise—that he’ll be a better artist—and by their proximity to works realized based on ideas formulated in the correspondence, they serve as a documentation of artistic thought and production. Within this fantastically complex exhibition, Torres blurs any standards regarding linear time or functional space, ultimately offering an opportunity to reconsider our understanding of reality.